How can I connect my Officejet 4500 printer wirelessly? Unfortunately we're not technically trained on printers. I have included the link below the the manual this may help. My HP Officejet 4500 Wireless printer detects my laptop through the router but asks for a WPA Passphrase. What is this and how should I get it? Thanks. Will my Officejet 4500 Wireless printer be able to carry out cartridge alignments if I use compatibles? When I've used refilled cartridges in the past the printer thinks they're empty and keeps sending signals. They also leak. How do I know yours won't be like that? Will my printer acknowledge recycled cartridges? The compatible HP Officejet 4500 Wireless ink cartridges that we stock are manufactured to a high standard and are rigorously tested. The cartridge chips have either been replaced or reset and the cartridges are either manufactured from new or are professionally refilled. You can expect the same high quality results from our compatible HP ink cartridges as you would expect from genuine HP ink cartridges. Should you receive a cartridge with a fault, or if you're not happy with the cartridge for any reason, then you can contact us and we'll look to replace the item, or have it returned for a refund. 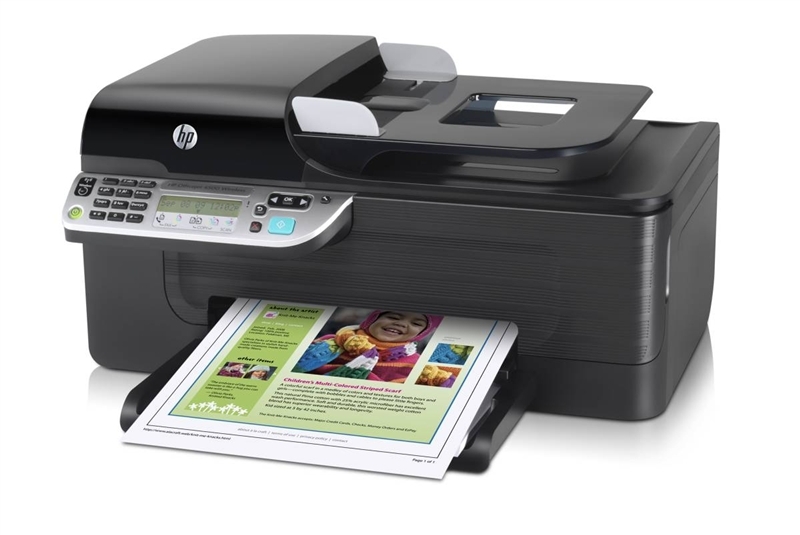 The HP Officejet 4500 Wireless is a multi-function device that has print, scan, copy and fax functionality. Aimed at the enterprise market the 4500 wireless has excellent print speeds and good print quality. Unfortunately, print capacity is limited which may put off businesses that print regularly and in large volumes. Scanning on the HP Officejet 4500 Wireless can be done using the flatbed, or the 20 page ADF that is located on the top of the printer. In terms of size, the all-in-one device measures 434 x 402 x 217mm which is fairly average for a MFP designed for office use. The printer doesn't offer any memory card slots or USB. Print cartridge installation can also be quite tricky, as it's located at the rear of the printer. If you're after quick speeds then look no further, the HP Officejet 4500 Wireless offers 28ppm in mono and 22 in colour. Print quality is equally as impressive - images and text appear clear and crisp. The ADF is also a real bonus for a machine of this value, and can really save you time when scanning large documents. Print capacity is the HP Officejet 4500's biggest downfall! With just one single 100 sheet tray – it's only a matter of time before it will need to be replenished. The LCD display on the printer is also disappointing, and lacks the functionality of some of HP's other printer models.